Are you a First Nations, Métis or Inuit grade 11 high school student who wonders what it would be like to study science or engineering at University? Then click on the video above and listen to some 2016 Kirkness Program scholars on why and how you should apply. This is a truly Unique Experience! A unique aspect of the Kirkness Program is that we do not ask for the student’s grades. Selection is based on the student’s essay which is their opportunity to talk about what they would like to do after completing grade 12 and how the Kirkness Program would help them make a choice regarding post secondary studies. The application also includes a reference letter from a teacher or counselor who indicates how the Kirkness Program would be of benefit to the student. Students will be chosen from across Canada to spend a week in a University research lab. With 2-4 students per lab, you will have someone your own age on this adventure with you! You will become a member of a research team for the week doing experiments and attending lab meetings. 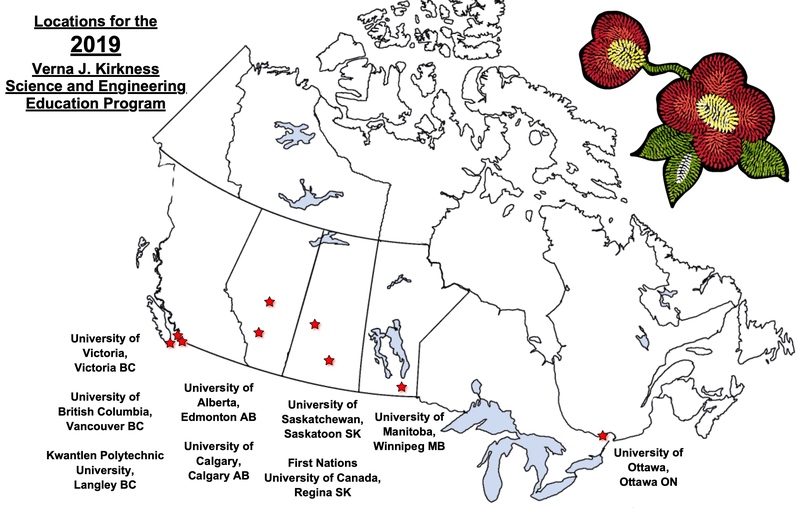 The University of Manitoba, University of British Columbia, University of Saskatchewan, the University of Calgary and the University of Ottawa, University of Victoria, Kwantlen Polytechnic University and the First Nations University of Canada all have excellent Indigenous Student Centres that are great resources and staff to answer any questions you have on attending University. You and your fellow students will spend Monday morning of the Program at the Centre with Elders and staff. You will spend the week in a student residence on the campus and eat at one of the many food outlets on campus. This experience will help you to understand what it is like to live on a university campus. For students attending the Program at Kwantlen Polytechnic University transportation will be provided to and from the campus each day. Successful applicants will have their meals, accommodations and travel expenses covered. To view a list of the Faculty and Projects for the 2019 Program follow the link below in Step 3 of the guidelines. Projects are designed specifically for Kirkness Program scholars. If you want more information on the mentors each University website has detailed descriptions for each professor. If you are interested in applying, please see your teacher or school counsellor who will help you fill out the application and submit your completed application by March 8, 2019. Applicants will be notified in March 2019. At the top of this page watch the video of the students who attended the Program in previous years. Additional videos are found on the opening page of the website and more are on the program description page. Complete the student information and the parent/guardian teacher information in Parts 1 and 2 of the Application. List 3 research mentors/programs in order by preference. In most instances, students will attend the University closest to their physical address. NOTE: We will try and match each student’s preference but this is not always possible. The sooner you apply the better chance you have of getting your research preference. Applicants must be prepared to work in any laboratory and University that they are assigned to. Ask one of your teachers or guidance counsellors to provide a letter of reference (Part 4 of the application). The letter of reference should indicate that you have the interest and ability to attend college, university or other post-secondary schools after graduation from grade 12 and that attending the Verna J. Kirkness Science and Engineering Education Program would help you to decide what you would like to study. Your reference should indicate how they know you and explain why you would be a good participant for this Program. In a maximum of 400 (TYPED) words, please explain why you are interested in attending the Verna J. Kirkness Science and Engineering Program. Please include your volunteer experience. Applications with less than 50-word essays will not be considered. This essay is the most important part of the application! Once you have completed the form save the Word file with your name and email the completed application form along with the reference letter (Part 4) and the consent form (Part 6) to Susan O’Brien at susan@vernajkirkness.org no later than March 8, 2019. Print this page and ask your parent or guardian to complete it. Give the signed consent to your teacher or guidance counsellor. Completed Parental Consent Form must accompany the emailed APPLICATION. Email to Susan O’Brien at susan@vernajkirkness.org or if you do not have a scanner please fax to 204-697-1318. In March of 2019, staff from the Kirkness Program will contact you and your Parent or Guardian about the Program. Provide accurate and complete contact information on the application. If we are unable to speak to your Parent or Guardian you will not be considered for acceptance into the Program. Please respond to all email correspondence promptly.